Adding length, thickness and fullness to your natural lashes with semi permanent eyelash extensions is a great way to enhance your eyes with little daily maintenance. 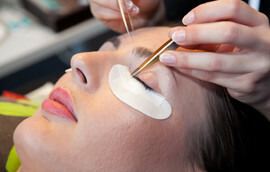 Become a professionally trained and certified Eyelash Extension Artist by completing our advanced training for Licensed Cosmetologists and Estheticians. Ur - bane \\ˌər-ˈbān\\ -adj. elegance, suavity, and style as characteristic of the sophisticated social life of major cosmopolitan cities. a Shade Urbane is the creative vision of Meredith Trimmer, an advanced professional cosmetologist who specializes in Everything Hair including Men's and Women's Cuts, Styling, Color and Extensions. In addition Meredith is a Master Esthetician who offers Eyelash Extensions, Waxing, Microdermabrasion and Lash Extension Classes and more. The beauty industry is in a state of constant and rapid evolution. It is with this understanding that Meredith is continuously pursuing advanced education through out the country. Her recent advanced education classes include hands-on cutting and coloring instruction given by Nick Arrojo, Phillip Wilson, Nicholas French, and Henry Calcogna, and advanced classes at the Redken Exchange in New York City and Wella Studios in San Francisco. Meredith Trimmer is currently bringing a Shade Urbane (her interpretation of cutting-edge cosmopolitan style) to St. George every week at Studio 359 and twice monthly to the Salt Lake Valley at Image Studios, Draper. Give her a call at 435-215-1066 to make an appointment and see the difference an advanced professional cosmetologist can achieve. Amazing hair stylist and colorist! I have very thick curly hair and for me, my hair use to be extremely hard to maintain. Meredith has made that easy for me now. The way she cuts it and the drying and styling tips she has given me has made it very manageable. One thing I love about Meredith cutting my hair is she listens to me and remembers from appointment to appointment what I like and what I don’t so there are never any surprises. I have now been going to Meredith for years and have referred all of my friends. If you want a great cut and a good luck, you HAVE to try Meredith out. I promise you won’t regret it! Amazing hair stylist and colorist! 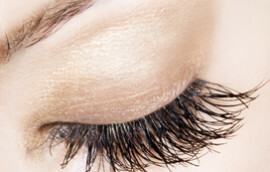 I have received countless complements on my eyelash extensions Meredith Trimmer does! I absolutely love her work!! I got my eyelashes done for my wedding and have been getting them filled faithfully since. Meredith has an unmatched talent with her skilled artwork of cosmetology while also creating an enjoyable experience for the client. She has always made me feel welcome, shows she cares like a friend, and even remembers what is going on in my life that we talked months ago about! I was extremely impressed, as well, with how she will always encourage me to let her know if something goes wrong with my eyelashes in between appointments and she will fix it free of charge! I highly recommend Meredith Trimmer to all of my friends and will continue to go to her as long as possible. After going through so many hairdressers and cosmetologists in my life I am thrilled to have finally found one I can stick with! I absolutely love her work!! Meredith at A Shade Urbane is amazing! I had been searching for a new hair salon in St George and I found A Shade Urbane. Meredith listened to my concerns, looked at the pictures I brought, and came up with a solution. I absolutely love my new color and style. Thank you A Shade Urbane and Meredith. I would recommend this salon to everyone. I would recommend this salon to everyone. Meredith has no equal. My hair grows in a dozen different directions, but somehow she is able to tame the beast and make me look respectable. I trust my hair to no one else. I always feel like a million bucks after a cut from her. I trust my hair to no one else.